Reposted and removed out of topic details. Please keep replies on topic and relevant! So will this Vehicle be for ‘Live in Heavy or Occasional Light Use’ as I actually like the set up you have got or intend having. Your findings look great & sustainable as posted, Have you done a longer field test in proper longer everyday use use ?. I don’t have a Heavy Main Use inverter fitted anymore (Use to have a Mastervolt 2500w Pure sinewave that done everything) Brilliant bits of kit, But I just have i Small portable micro one now of 150w & a 300W one on my Portable Power Pack opting for a decent Genny installation for my Power Demands nowadays. I Do have Gas, But my 22lt Refillable bottle has lasted me close on 14 months now & has Still got 5lt left in it. No Solar, No Big Battery Banks, No Gimmick or super Gismos just Domestic Appliances Where possible Through out. The reason for this test is to put some solid and specific data to backup (or refute?) my findings. The Class A++ Fridge I bought is spec'ed to consume around 84kW per Annum - that is 218Wh per day, so in typical '12V speak' 18Ah a day, or just 0.75A average draw over the day - lower then a Dometic Weaco CRX-50 average draw. Pretty impressive but does it really deliver and what about the Inverter overhead? Two common questions that are worth answering. 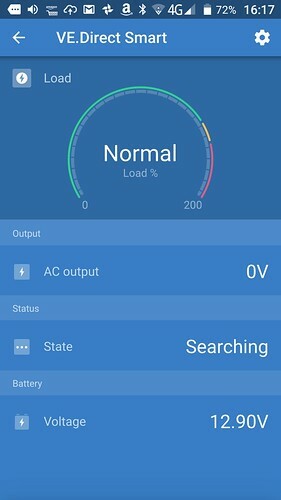 I normally have the Fridge on a Victron Inverter where I can monitor via their Bluetooth App the instantaneous power being drawn, but the Fridge is actually drawing power for so little time, I actually have yet to see it register! (I have put other loads on the inverter just to make sure the app works - it does!!). Reason for No Gas? I am far more comfortable with Electricity then Gas basically for various reasons. My plan is to use my Camper as: a Holiday Vehicle; As a workshop and be able to use mains powered tools if I need; Plus an alternative to hotels if working away. I found my previous 200Ah Battery Bank pretty ok for that power tool use, but I did have a Gas Hob in that. As I will be cooking with an Induction Hob I might well need more power and recharge more - so doubled the Battery Bank and Solar Array. Backups ... Small Portable Gas Hob and Cadac Gas Grill for outdoor use; Hookup Connection available of course (I have the wiring setup so the kitchen AC sockets will power off EHU or off Inverter, switching automatically to whichever is availble), and Split-Charge from Alternator (when I get round to installing that). I haven't discounted the idea of a generator either, but I am hoping (expecting) it will not be neccessary. As I’ve said many times on here before I am a firm believer in doing what works for you & your lifestyle or requirements as we are all different & use our vehicles differently. Part n Parcel of that is offering ideas or intentions up for debate. So well done you, Brilliant information posted & Thanks will be looking forward to updates. Firstly, I have installed a 2nd Power Monitor onto the Victron Inverter, and also printed off a couple of Boxes to put the Monitors into to both protect them and identify between the two more easily. So info taken within a few minutes of first 24 Hours after initial start test. GREEN Bottom Left - Power (W): Current Draw in WATTS - This is simply Current x Voltage (P=IV). GREEN Bottom Right - Power Consumed over Time (Wh): This is what we are interested in! So the Fridge+ Inverter has consumed 270Wh in the last 24 Hours. This relates to an average of 11.25W per hour, or 0.9A per average average. In '12V DC' Parlance, that is around 22Ah per 24 hours. In this current cold temp, it is impossible to do a direct comparision, and I don't intend heat up the interior to 25C for days just to do a test (that can wait until nature heats it up for me), but I think already we seem to be in the same ballpark. Looking at the other Monitor, BLUE Top Right is 0.62A - This represents the no-load Inverter overhead. Victron make pretty well the most efficient Inverters, so the difference between the Victron and the cheap 1000W Unit is surprisingly small. The ON-Load number might tell a different story? You really have gone into it with some FANTASTIC information to back it up !. The inverter model WILL make a difference but not a significant one. That is the reason and I don't want the thread to go down an irrelevant rathole. I stated the exact model of inverter in an earler thread and ended up with a member discussing Amazons policy on product description. Yeah, right, very relevant to Fridge consumption. Not trying to sell anyone anything, just imparting information from some testing that I would be doing anyway and which may be of interest to others. What does "theory despite 101 figures is probably flawed" mean? I don't understand? So I will try and cut to the chase and suppress the waffle until the end so can be more easily avoided! Power used in first 24 hours was 270Wh; Power used in second 24 hours was 300Wh (total of 570Wh). So it won't be until say May that I will be able to reliably compare against quoted Weaco numbers. Right now the Inverter overhead represents nearly 90% of total power consumed. This is because I have worked out the fridge is actually running for only 40 minutes per day! Just 5 cycles of 8 minutes each on average, so for 23 hours, 20 minutes, the power used is just the inverter running on no-load. To confirm the above, I have fitted an AC Wattmeter for the Fridge to plug into - the Power Monitor is reading the total Fridge+Inverter consumption as a whole. The Wattmeter will be reading purely the power consumed by the fridge, so with those two meters, will be able to get the exact Inverter overhead, both off-load AND on-load. That won't be for a day or so. As per the notes in the earlier paragraph, the actual consumption will not be typical of an annual consumption and need a summer comparision as well to see the full picture. As mentioned in a previous post, I never see the fridge register anything on the App and that is clearly because it is so rarely 'on'. Difference between ECO mode and ON Mode? When the Victron Inverter is in ECO Mode, when it is searching it uses 2.3W, and when it is in Standby, it uses 0.6W. That is a massive difference in power! I haven't been using ECO mode previously as it needs a minimum power load to turn on when searching and the Fridge Light is not enough so you would open the fridge and every 5 seconds or so the light would flash on and off as the Inverter went to Search mode. Now given the fridge only seems to be on for around 40 minutes a day, being able to run the inverter in ECO mode could make a massive difference to overall power consumption. Well, we shall see within the next week I think. The last 24 Hours showed the Victron using 206 Wh while in ON Mode and no load connected to it. The next 24 Hours in ECO mode with no load connected will be a good comparison. Power used in second 24 hours was 300Wh (total of 570Wh). Doing some sums, this means the Fridge seems to consuming between 30-37Wh a day. I just don't understand these figures ! You state one day was 270Wh and the other 300Wh, so what is the 30-37Wh a day about ? Did you mean 30-37 ah a day, and if so how did you calculate this? Interested in the make and model of the fridge, the ones I've been looking at seem to 1-2 kWh a day which would give very different results. Any chance you could convert the WH figures into Amps ??? so day one the total power was 270Wh, and day two was 300Wh - so 10% variance in a day .. reasonable enough. the 30-37Wh a day represents how much the actual FRIDGE is using seperate from the Inverter overhead. If you assume NO Inverter overhead when there is a load, fridge uses 37Wh (55*8/60 * 5). Choice of Fridge is key. I bought an A++ Energy Rated Fridge. An A+ one is significantly worse and an A rated fridge I would say is a non-starter for general Motorhome use unless you are on hookup up daily. A Fridge Freezer would use a lot more than just a fridge as well. Nope, wasn't 37Ah, but 37W (as per previous reply). Ref the solar - good thought process but not in this test :; One reason why I fitted the Power Monitors for the test is that while I have a Battery Monitor which is very good (Victron BMV-712), it is a Systems-wide monitor, so Solar harvesting would skew it one way; putting lights on will skew the other and using that would tell us very little. So ... I am monitoring the load specifically out to the Inverter, so any other loads - say lights, for example, or any charging in from Solar or Battery Charger will have no effect on the test other then to make the DC Battery voltage lower or higher (skewing the Ah values in the process, which is why I am using Watts as that is not effected by voltage (as per the note to mistericeman). I fitted an AC Watt Meter to the Inverter Output Socket and that shows the Fridge itself used 90Wh in the last 24 Hrs. The Manufacturers quote 220Wh/Day. 90Wh to me sounds pretty understandable considering the cold test environment compared to a kitchen and that the Fridge Door is never opened between Test intervals, so no heat loss from that occuring (or light on). This 90Wh also ties in very well with the previous info, which indicated the Inverter Overhead was 10Wh an hour off-load. So if the inverter was on for 24 Hours, it would consume 240Wh. Add in the 90Wh the AC Watt Meter recorded for the fridge and you get 340Wh total. The Battery Power Monitor gave us a total for the last 24 hours of 335Wh - that is just about only a 1% variance. So finally can make some first conclusions* about something in the test! Extrapolating into normal operating temperature and usage based on Manufacurers Specs, I am concluding that: For a AC Class A++ Fridge running off a typical Inverter, expect a Power Usage of 460Wh per day. This equates to around 38Ah/Day, or a constant 1.58A. *This may not be the case with a higher load - The Fridge has been only 10% of the Inverter Capacity. I will carry out a test with a higher load and check. 1.19Ah/h Average equals 14.28Wh (based on DC Volts being 12V), which is 342Wh/Day - far less efficient then the AC Fridges 220Wh/Day Average. With the Inverter used in the test adding in 240Wh, the AC Fridge Option (using Manufacturer power of 220Wh/Day) draws an average of 0.39Ah/h (9.36Ah/Day) more than the DC Fridge - that is under 5W an hour, around the same as an interior light left on. With a better Inverter, it is very likely the Inverter+AC Fridge Combination will have a LOWER total consumption then the dedicated DC Compressor Fridge. I have now unplugged the Fridge from the 1000W Inverter and inverter is turned off. My Testing has now moved onto using the Victron Inverter in ECO Mode - this is a better inverter then the one used in the testing above, but is also significantly more expensive. I will post first data from the Fridge+Victron Tests tomorrow. Left Dell in 2001 - what about you?